Charles L. Grant has been writing for thirty some years now, and in that time he's published over 100 books in various genres, with a number of his novels appearing on the bestseller lists of USA Today, New York Times, Los Angeles Times, and London Times. His nearly two hundred short stories have been published in anthologies and magazines worldwide. He also edited the award-winning anthology series, Shadows. Other anthologies included Gothic Ghosts (with Wendy Webb), the Gallery of Fear, and the Greystone Bay series. In 1987 he received the British Fantasy Society's Special Award, for life achievement. 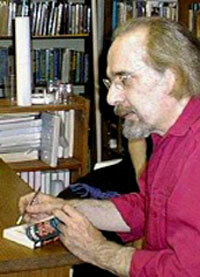 In addition, he has received two Nebula Awards and three World Fantasy Awards for his writing and editing. In 2000 he was given the Horror Writers Association's Lifetime Achievement Award. In 2002 he was honored with the Grandmaster Award of the World Horror Convention. A graduate of Trinity College in Hartford, Grant served two years in Vietnam. He is a past officer of the Science Fiction Writers of America, served ten years on the Board of Directors of the World Fantasy Awards, and is a past president and trustee of the Horror Writers Association. He shares his Victorian home in northwestern New Jersey with his writer/editor wife, Kathryn Ptacek, five cats, and a lot of cobwebs and a few earwigs. Currently he is at work on a dark fantasy novel. The Hour of the Oxrun Dead, The Sound of Midnight, The Last Call of Mourning, The Nestling, The Pet, and In A Dark Dream were all nominated for the World Fantasy Award in the Best Novel category. In A Dark Dream was nominated for the Bram Stoker Award in the Outstanding Achievement, Novel, category. The Pet, a lead hardcover from Tor, has been optioned for motion pictures, and was nominated for Best Novel by the British Fantasy Society. Goblins and Whirlwind were #1 bestsellers in Great Britain and Germany, and in the top ten of several major lists, including USA Today, in the US. The Donald M Grant publications are an historical series of old-fashioned dark fantasies, in limited illustrated editions. Most of the Dark Fantasy novels have now appeared in British, German, Japanese, French, Spanish, and Italian editions. Tales from the Nightside was nominated for the World Fantasy Award. Nightmare Seasons *received the World Fantasy Award* for Best Collection. Dialing The Wind was nominated for the World Fantasy Award. Shadows 1 *received the World Fantasy Award* for Best Anthology. Shadows 2-7, Final Shadows, Nightmares, Gallery of Horror, and Horrors were all nominated for the World Fantasy Award. Over a dozen stories in these anthologies have been nominated for the World Fantasy and Bram Stoker Awards. Five have won. Many more have been chosen for inclusion in Best of the Year anthologies and/or have been produced on television. Most anthologies have appeared in British, Dutch, Spanish, and German editions. Published over 150 in all major genre magazines and anthologies, with translations in most European markets. Over two dozen have been nominated for science fiction and fantasy awards. "Confess the Seasons" *received the World Fantasy Award* for Best Novella. "A Crowd of Shadows" *received the Nebula Award* for Best Short Story. "A Glow of Candles, A Unicorn's Eye" *received the Nebula Award* for Best Novelette. "A Crowd of Shadows" was optioned by NBC-TV for a television movie. "Temperature Days On Hawthorne Street" was adapted for television's Tales From the Darkside.